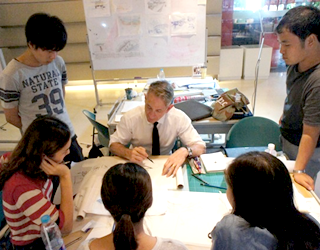 The Organization for International Collaboration of Meiji University set up the Program for Japan ASEAN Mutual Understanding when the Active Leaders Development Program Focusing on ASEAN-Japan Literacy was selected as one of the Re-Inventing Japan Projects for fiscal year 2012 initiated by the Ministry of Education, Culture, Sports, Science and Technology (MEXT). The Program for Japan-ASEAN Mutual Understanding aims to nurture active Japan-ASEAN leaders who can serve as cultural bridges between Japan and Southeast Asia in various practical fields. Such leaders should have English skills, practical competence in actual practices of work, and an understanding of Southeast Asian languages, culture, and systems (i.e. have ASEAN literacy). 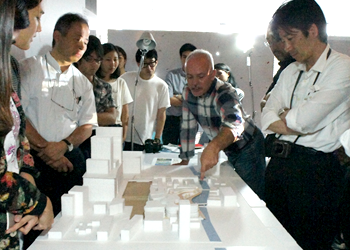 International workshop hosted by International Program in Architecture and Urban Design, Graduate School of Science and Technology, Meiji University.